Before delving into the process of teeth whitening, we should consider the problem — teeth stains. What exactly is a tooth stain? The tooth consists of a hard exterior layer that protects the layer underneath, particularly the dentin. Anything that enters your mouth – cigar, coffee, food – creates a second layer on the enamel slowly. The external materials build up to form a sheet on the enamel. A dental expert can scrape the sheet using dental tools and chemical treatments. You can even clean some of the blemishes away by brushing with abrasive toothpaste. Whitening toothpaste generally works better on the enamel layer. The issue is that when these blemishes remain on the teeth for too long, the foreign materials may find their way into the enamel. The enamel layer consists of hydroxyapatite crystals, combining to create tiny hexagonal rods. This simply means the enamel is porous and can allow staining agents to find their way into the internal layer of the tooth where it becomes harder to remove. Although harmless, they can be unattractive. There are several ways to whiten the teeth – from in-house whitening kits, such as whitening toothpastes, which clean surface blemishes to light-activated methods performed by the dentist for tougher stains. Bleaching – used for both minor and deep stains, bleaching can lighten your natural tooth color by up to five to seven shades. In-house kits (trays), over-the-counter kits and in-office whitening use a bleaching process. Bleaches have an active ingredient, carbamide peroxide, with a concentration of about 10-22% to clean both surface and deep blemishes. 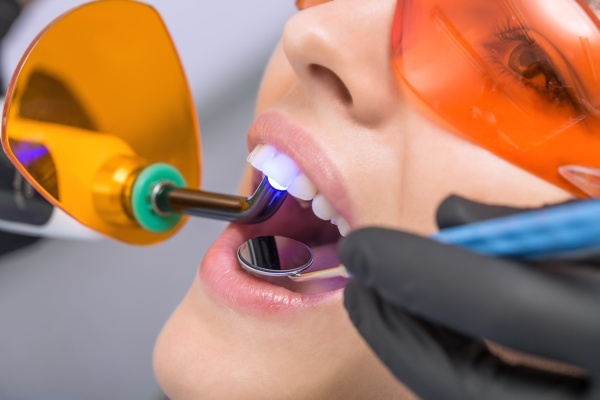 In-office bleaching, often called chairside bleaching, uses special lights to provide instant and more significant differences in teeth color. The treatment lasts about a year, but you may have to revisit your dentist if you enjoy drinking teeth staining drinks like coffee, tea and soft drinks. For in-house whitening, the dentist will create a dental tray containing whitening agents for you to wear for several hours daily or overnight for at least two weeks. Once the stains start appearing again, you only have to wear the dental tray again for a few days to clean the stains. Over-the-counter whitening kits from your local drugstore can be the boil and bite tray, whitening gels or whitening strips. Non-bleaching methods remove surface blemishes from the teeth through physical or chemical reaction. Every toothpaste uses minor abrasion to clean visible stains before visiting the dentist. Whitening toothpastes usually contain unique chemical or abrasive agents for extra discoloration removal. When cleaned by a dentist or dental hygienist, abrasion and polishing cleans most surface blemishes resulting from food and tobacco use. Different people have unique reactions for different whitening methods. While whitening toothpaste may be enough for some people, porcelain veneers or bonding may be required by some to hide severe stains or discoloration. Ensure you discuss these with your dentist to know which method would work best for you. Request an appointment here: https://www.drhai.com or call Ping Hai DDS at (770) 239-2722 for an appointment in our Marietta office.